BCG held its annual Bring and Buy sale after a rehearsal on 21 January raising over £250 to go towards events this year! 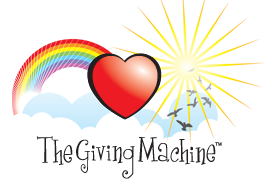 The choir couldn't survive without these extra fundraising events so thank you to everyone who contributed towards it. Cress runs the Bath Half for BCG! Cressida Lyon, BCG soprano, donned her running shoes on Sunday 13 March to run the Bath Half Marathon in aid of choir funds. Raising almost £700 and beating her personal best time (1hr 49mins) we think she deserves to put her feet up (whilst listening to the Walton, of course)! Here she is nearing the course finish line and still able to crack a smile and thumbs up! Thanks, Cress, you're a star! ​Belshazzar’s Feast 4th June St John the Evangelist. A large professional orchestra with the combined choirs of Bath Cantata, Bradford Choral and Paragon Singers, conducted by Neil Moore, completed an already remarkable evening in a dazzling performance of Walton’s ‘Belshazzar’s Feast’. Here the intense musical drama unfolded in huge waves of gorgeous sound, interspersed with narrative powerfully sung by Benjamin Bevan. The evening had started with Vaughan Williams’ ‘Te Deum in G’ in which choir and orchestra gave an exciting foretaste of what was to come. This work is full of contrasting passages over a wide range of dynamics and these were managed seamlessly with a fine sense of line. Then there was a supremely passionate and beautiful performance of Elgar’s cello concerto, played by Tim Hugh, a one-time student of Jacqeline du Pré. Somehow Neil Moore managed to bring about an extraordinary dialogue between cello and orchestra which revealed an underlying mix of heart-felt yearning, joy and confident expectation. It was profoundly moving, and the capacity audience responded, it seemed, with a great silent intensity of shared feeling. Such a wonderful evening. Bath Cantata Group (Bath's longest running chamber choir, established in 1955) is delighted to invite singers for our third Come and Sing Choral Workshop. For this we will be looking at the choruses from Rossini's outrageously operatic Petite Messe Solennelle at St Luke's Church, Wellsway, Bath, BA2 2BD. The workshop and performance will be directed by BCG MD Neil Moore and accompanied on St Luke's wonderful grand piano by BCG accompanist Will Ashworth. The workshop beings at 09.30, with registration from 09.00. At 16.40 there will be an informal performance and the workshop will end at 17.30. The cost is £20/£15 concessions (students) and includes score hire. of works he called his “Péchés de vieillesse”, Sins of old age. 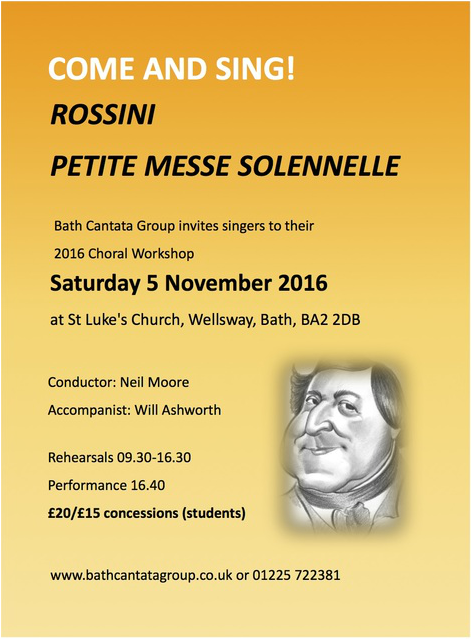 Bath Cantata Group launches their 2016/17 season with Rossini's Petite Messe Solennelle. This work is one of the biggest misnomers in musical history. It is anything but ‘petite’ and is most certainly not ‘solennelle’ but brims over with the colour and drama to be found in any of Rossini's earlier Italian operas. Although orchestral parts were added later Rossini originally composed it in 1863 for soloists, SATB chorus and just two pianos & harmonium. This is the version we provide for our November concert.